HI all, I'm new to Veeam and have read a lot of guides, but am still struggling to get this setup. Using Windows Server Backup we have previously been able to backup a Hypervisor and all its VMs to a pair of USB hard drives. These drives are rotated by the customer, when they want to. The Windows Server Backup will backup to either of these drives if they are present. It only errors if neither drive is attached to the server. We are trying to make a setup like this using Veeam, but so far I have not managed to achieve this. I can activate the "rotating backup" option, but that does not let me select a range of drives, just a single drive for a repository. The backup job only allows one repository to be selected. This leads me to think that I will have to create two backup jobs, one of which will always fail and send an error message to me. I would like to avoid this if possible. When you swap the USB drives they need to come into Windows as the same drive letter. Then add that drive letter as the veeam backup repository and configure the the this repository is backed by rotating drives. 6) How then do we add this second repository to the backup profile without removing the first one? You dont add the second disk as a repository. 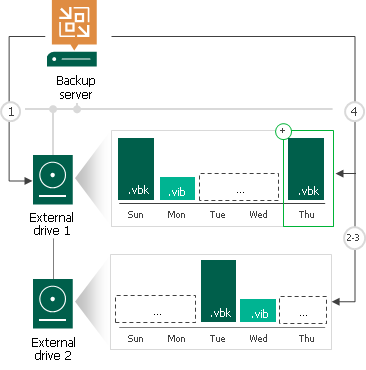 when it is connected instead of drive 1 it needs to appear as the same disk drive letter and veeam will send backup files to it. the image above will show how that looks from a backup point of view. Presumably it only has appear as the same drive letter once, ie when we are setting things up? After that it will be able to find it when Windows decides to give it another drive letter just because it feels like it? Thanks for your help, the guides just did not make it clear enough that this was how it worked. Sorry if I am being a little slow. Correct, you need to make sure all the drives keep the same drive letter during the first backup to them. On subsequent drive switches Veeam B&R will "follow" the drive on the letter change (provided this is a Windows type repository).